Set in the adventure-rich state of Wyoming, Grand Teton National Park sits high on the horizon and attracts visitors from around the world. Spread throughout the different vantage points of this iconic alpine landscape, scenic campgrounds can be found waiting for you to spend the night. Split between concessionaire campgrounds within park boundaries, US Forest Service campgrounds in the surrounding national forests, and backcountry camping zones for backpacking, the campgrounds near Grand Teton National Park provide easy access to the impressive peaks. Whether you pitch a tent in the Jenny Lake campground, or plug into a spot at the Gros Ventre (pronounced “Grow Vaunt”) Campground, all campgrounds near Grand Teton National Park are in bear country, and each campsite invites big adventures with just one night’s stay. Found at the heart of Grand Teton National Park, the Jenny Lake Campground contains some of the most popular campsites within the park and ranks as one of the best campgrounds in Wyoming. 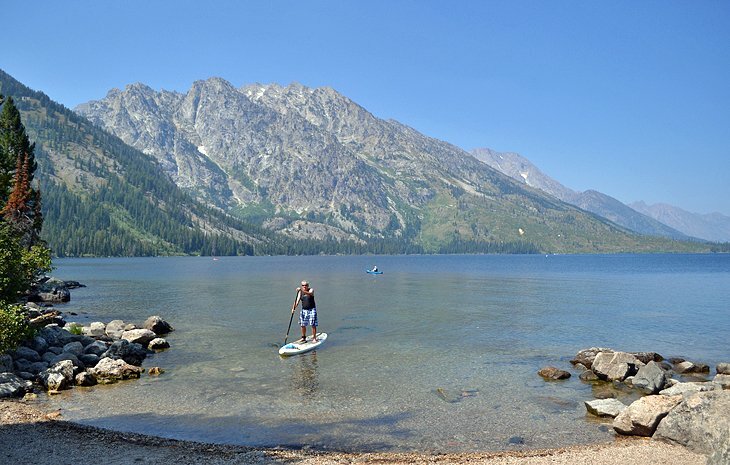 The campground is operated by the Grand Teton Lodge Company, and it’s not just the supreme scenery of the adjacent Jenny Lake and Teton Range horizon that makes it so popular, it’s the central location that draws a crowd.